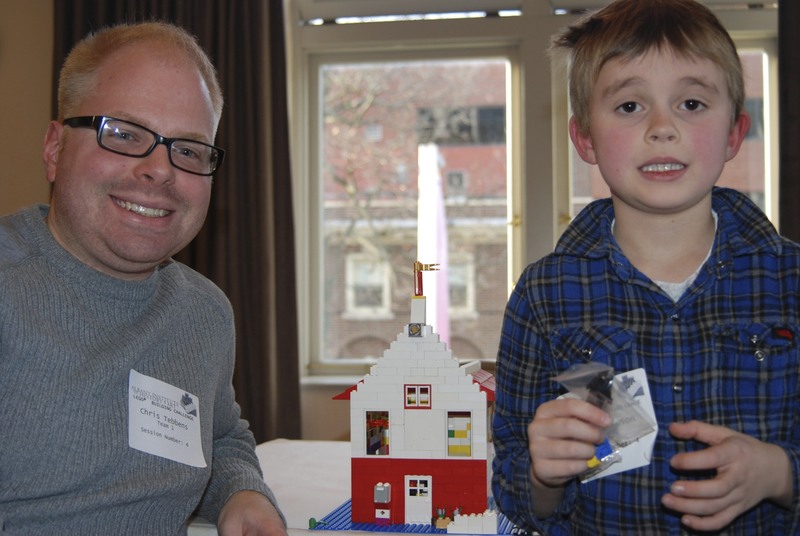 This weekend we went to a Lego building competition at the Albany Institute of History and Art. It was free and I’m so very thankful I found out about it early and had us preregistered. It was crowded and some people waited around hoping for no-shows so they could participate. 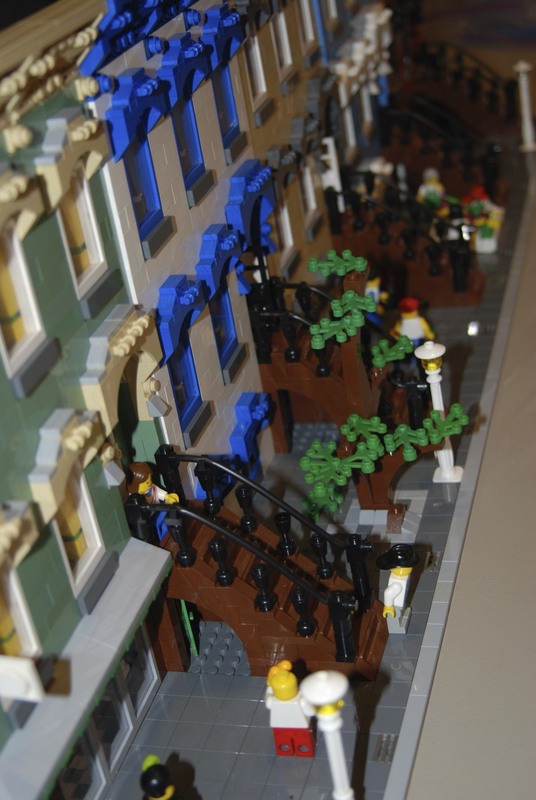 The theme was Albany Architecture and we were more than happy to take on the challenge. You weren’t required to stick to the theme but we thought it would be fun. We decided to make a Dutch-style home, with a jail inside. The jail was all Jack’s idea. The cop is holding a gun on the robot in case he tries anything tricky. The stolen jewel is to the right of the cop, as is his desk with laptop. Jack and Chris figured out the basic design structure while I picked through the bin of Legos on our table in order to sort out the bricks we needed. We left the very top of the roof open so you could see in to the cop and the prisoner. The prisoner was a robot who stole a jewel, in case you were wondering. 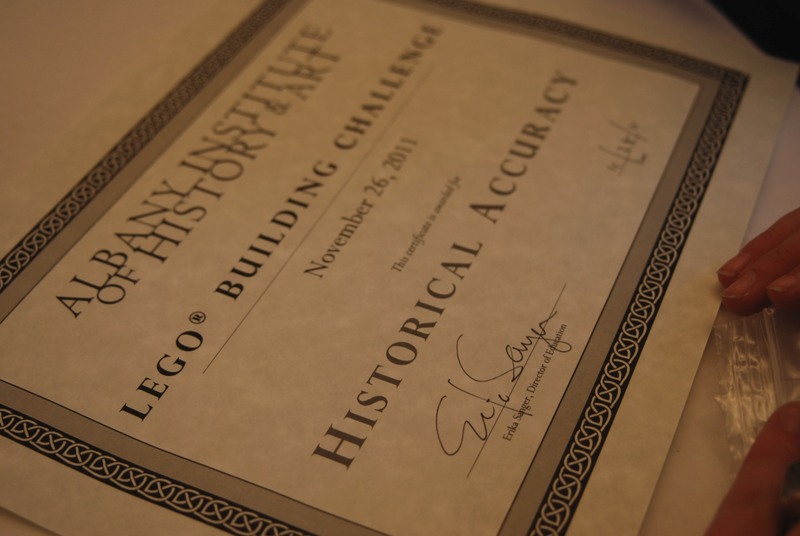 We won “Most Historically Accurate” building, which we view as essentially winning the entire thing, since that was the main theme of the event. 🙂 We are a very humble family. 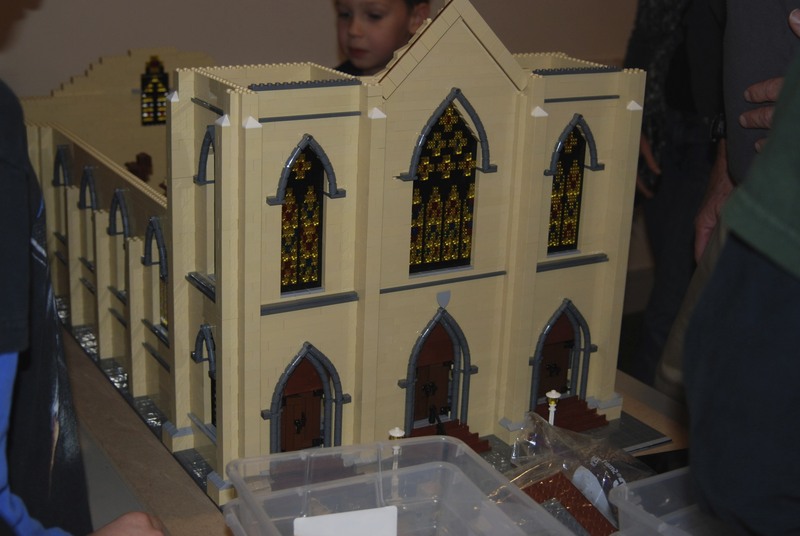 There was a man there who does Lego building for fun and he had a display of Albany row houses, and he was building his model of the Trinity Church, which was torn down this past summer. It was pretty amazing. 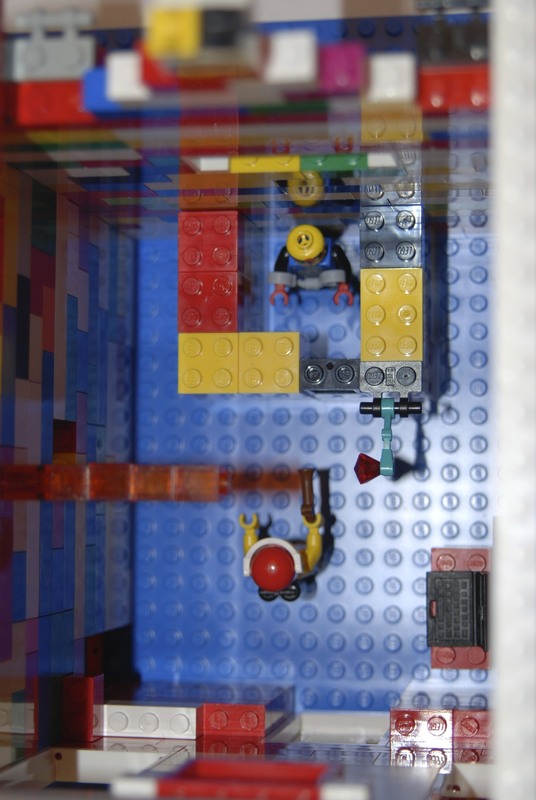 Minifigures fight on the side of what looks like a crazy temple of doom. 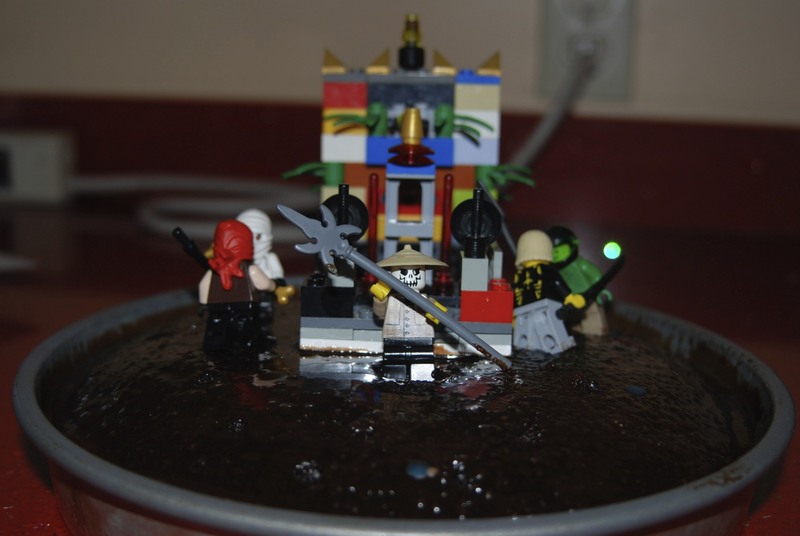 Sunday was Jack’s birthday party complete with Lego decorated cake and cupcakes. For the cupcakes I just put a few bricks on each but I let Jack create the whole topper for the cake on his own. It was pretty incredible. ***Right now there is a cool George Washington exhibit at the Albany Institute as well. We saw that and a few others including one on mummies. Jack loves mummies and could hardly fathom we were really looking at a dead person. This entry was posted in creative projects, family fun, homeschooling, kids on November 29, 2011 by Erika T..
Me in my costume. 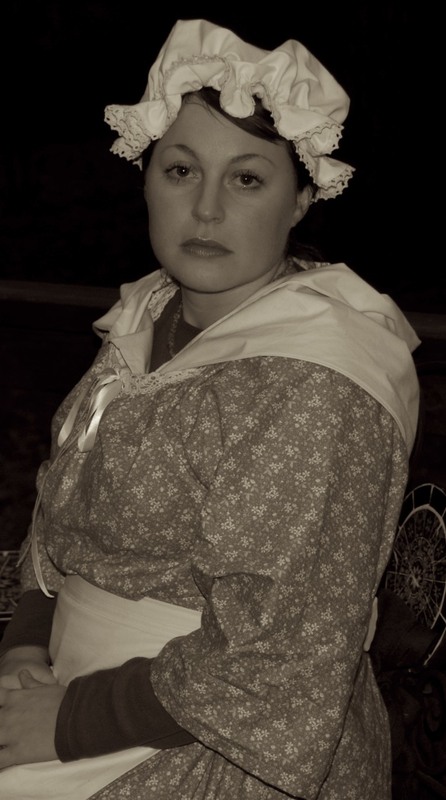 I'm pretending to be in an old-timey portrait, looking very grim, probably because half my children have cholera. I realize I’ve been a tad M.I.A. these past few weeks but that’s mostly due to my fall-onset desire to absorb into my couch at night and also the crazy amount of fun things we’ve been up to. As a quick recap: Halloween went well, both mine and Jack’s costumes worked out. Now I need to start thinking about next year. We recently went to a wedding in Cooperstown, which ended up being like a mini vacation. I’m prepping for Jack’s birthday party and there has been lots of recent holiday cooking/baking. 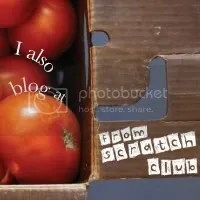 I just wanted to say “thanks” to anyone who has ever read anything here. Although this is mostly a record for us to track the things we’ve made and done, it’s nice to know others enjoy it as well. We’ve had a really wonderful year and much to be thankful for. I know we are truly very lucky. I can’t wait to see what’s left in 2011! This entry was posted in Uncategorized on November 25, 2011 by Erika T..